Dr Eric Daiter is an experienced infertility expert with considerable expertise in the diagnosis and treatment of ectopic pregnancy. If you have any questions about ectopic pregnancy, or you need treatment options for an ongoing ectopic pregnancy, Dr Eric Daiter would be happy to help you (in the office or on the telephone). It is easy, just call us at 908 226 0250 to set up an appointment (leave a message with your name and number if we are unable to get to the phone and someone will call you back). "I always try to be available for my patients since I do understand the pain and frustration associated with fertility problems or endometriosis." "I understand that the economy is very tough and insurance companies do not cover a lot of the services that might help you.Â I always try to minimize your out of pocket cost while encouraging the most successful and effective treatments available." 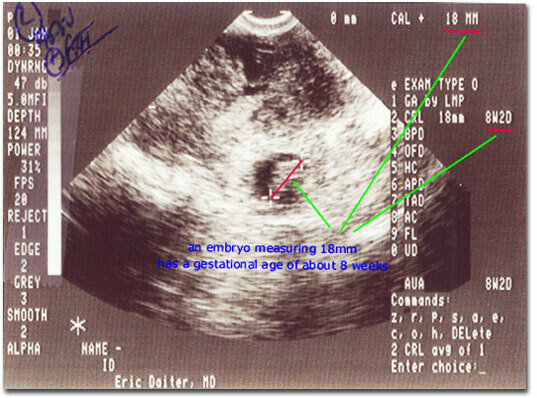 This ectopic pregnancy was diagnosed when a fetal heart beat (FHT) was identified within the left adnexa. Transvaginal ultrasonography has very high resolution, but misses ectopic pregnancies in a large number of cases. The adnexal findings in the presence of an ectopic pregnancy are often nonspecific, with the obvious exception of a FHT.